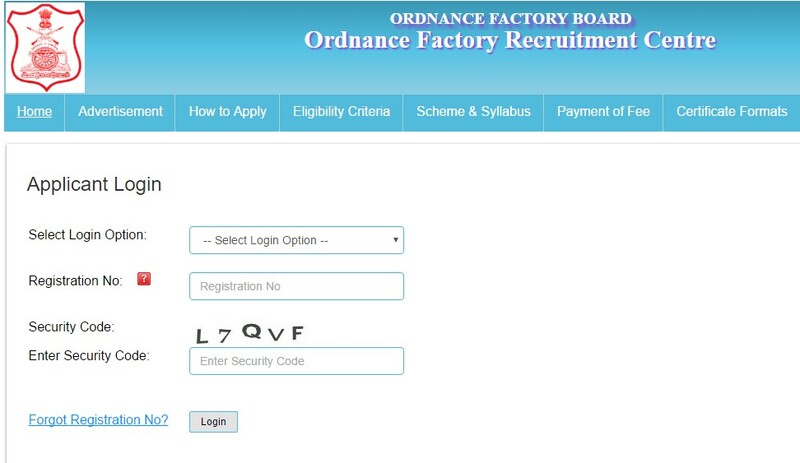 The Ordnance Factory Board (OFB) has released the Ordnance Factory Recruitment Center (OFRC) admit card for the first phase written examination to the students who have applied for the direct recruitment of semi-skilled grade industrial employees (IEs) Group ‘C’ in various ordnance factories. The first phase written examination has scheduled and to be held on 10th September 2017. Follow the steps to download the OFB OFRC Group C recruitment 2017 admit card online. Then, go to the students login page to download the admit card. Enter Registration Number and Date of Birth or use Registration Number and Password. Read the instruction which appear on the screen. It is useful for further reference, so download the instruction on your device. Accept the declaration by click on the checkbox. Now, click on print admit card. The OFB OFRC Group C recruitment 2017 admit card will download on your device. Then take a printout, it is important to write your written examination on September 10. Read the scheme and syllabus of the OFB OFRC Group C recruitment 2017 written examination in the official website itself. All the latest news and updates on recruitment is available on the OFB official website.